French Dip Reviews: The French Dip Sandwich at Seattle, WA's Volunteer Park Cafe Awarded a 4 of 5 DeliciScore™ (Really Good) on this 29th day of January, 2017 - Great experience, really good sandwich. 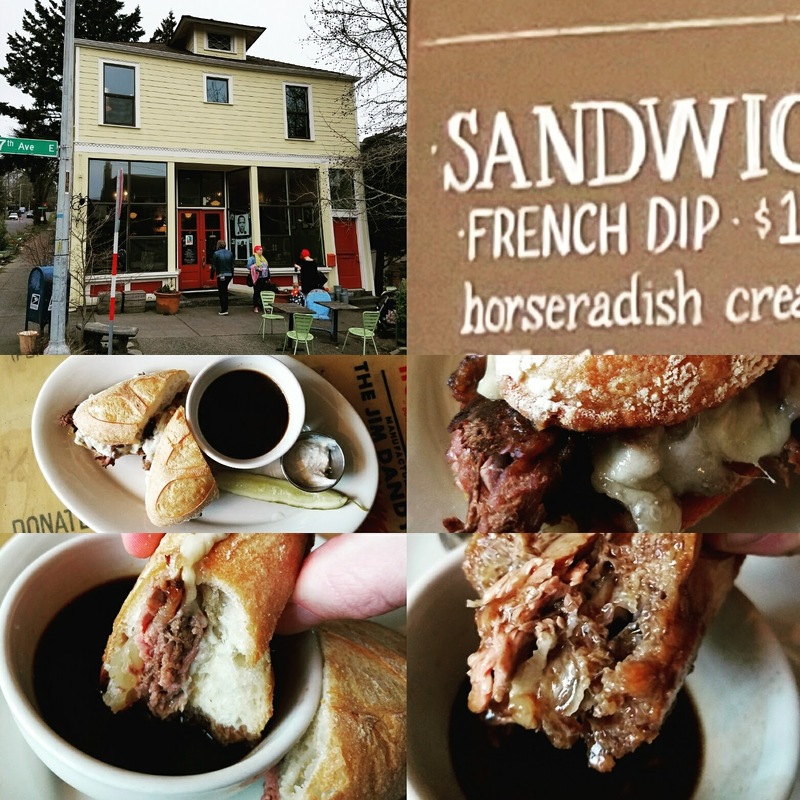 The French Dip Sandwich at Seattle, WA's Volunteer Park Cafe Awarded a 4 of 5 DeliciScore™ (Really Good) on this 29th day of January, 2017 - Great experience, really good sandwich. 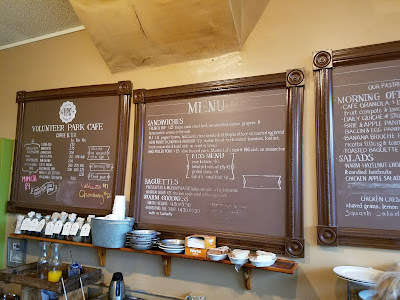 It was a slow, Winter Sunday afternoon and I was hungry. 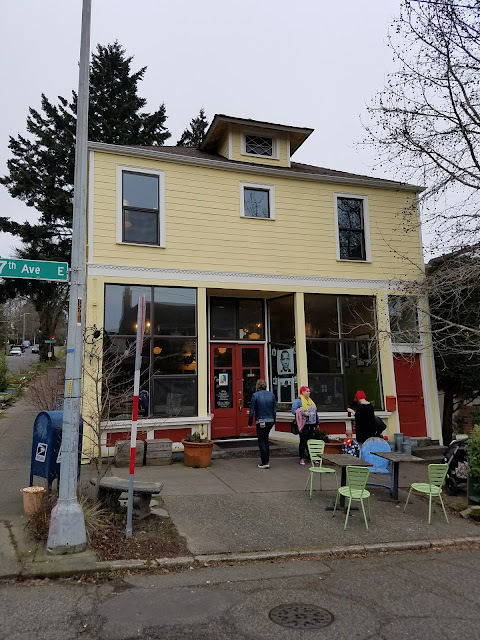 I talked my wife into taking me to the Volunteer Park Cafe, to which I had never been, although it had been on my list of places to go for their French dip. 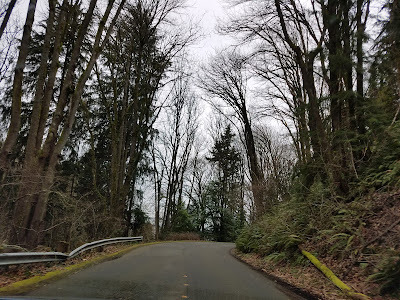 Here we are driving through Seattle's famous Interlaken Park on our way up there. 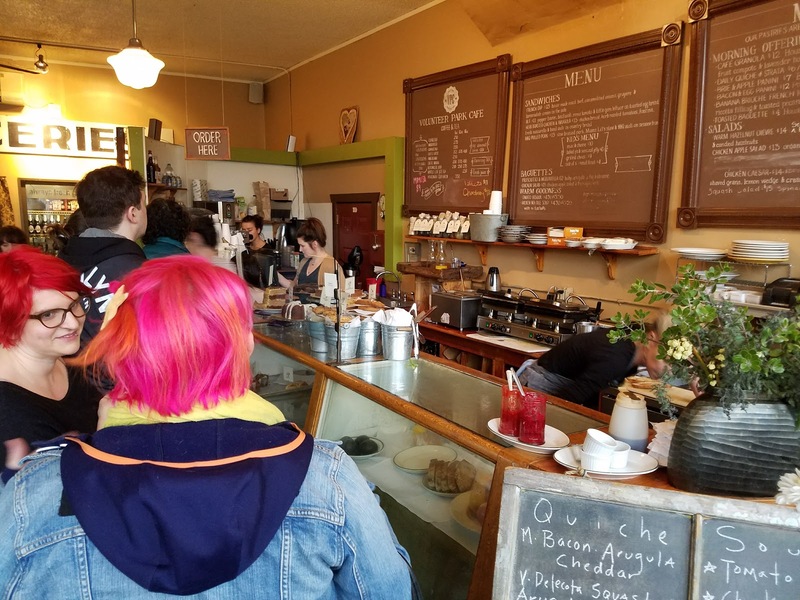 And we arrive at Volunteer Park Cafe. I had never even seen it although I have lived in Seattle since 2000. It is a very cute, very neighborhoody place and there were hipsters galore. Here we see two face redheads going into the place. I'm not judging, only observing. My new Samsung Galaxy S7 has some sweet modes on it. Not sure what this one is called but it's kinda sweet. 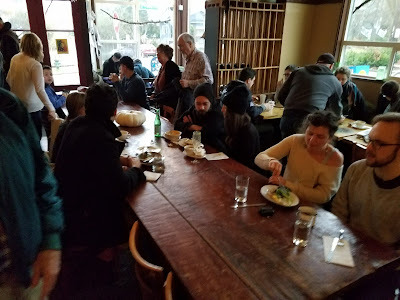 You can see their long, communal table which I think is great. 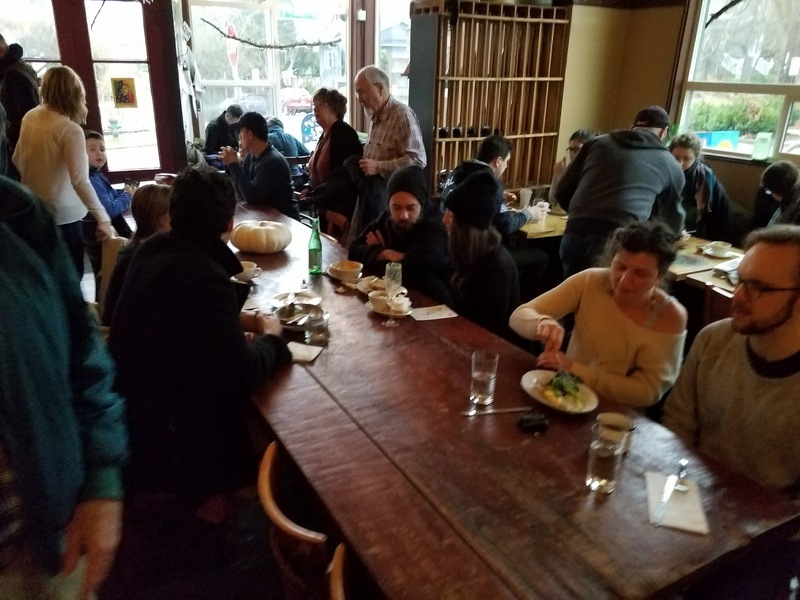 The table is one of my favorite features of Brave Horse Tavern in South Lake Union. 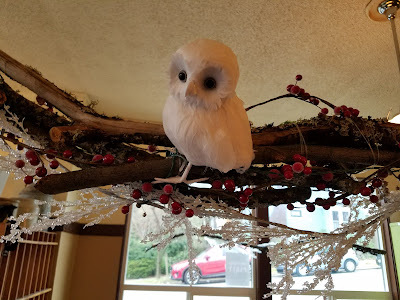 It gives things a good, cozy vibe. Another one of the fancy modes on my camera. This is a panarama of the inside as a did a full whirling dervish impersonation to get this photo. As we could tell from the hipsters outside, there were clearly liberal hipsters running this joint as well. I think it's great. People in Seattle right now (and all over!) 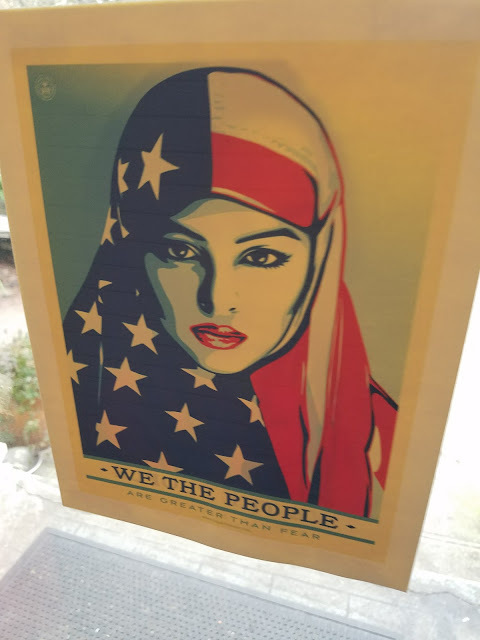 are losing their minds over Trump in office and some of his new policies and executive orders such as his "Muslim Ban". 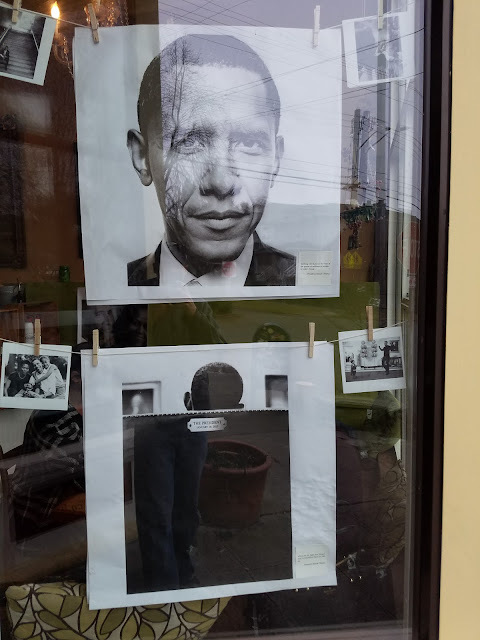 And they love and I'm sure miss Obama. I'll admit it 100%, me too. Oh, Donald, what are you going to do to us? And so we joined a fairly fast line behind the two faux redheads. 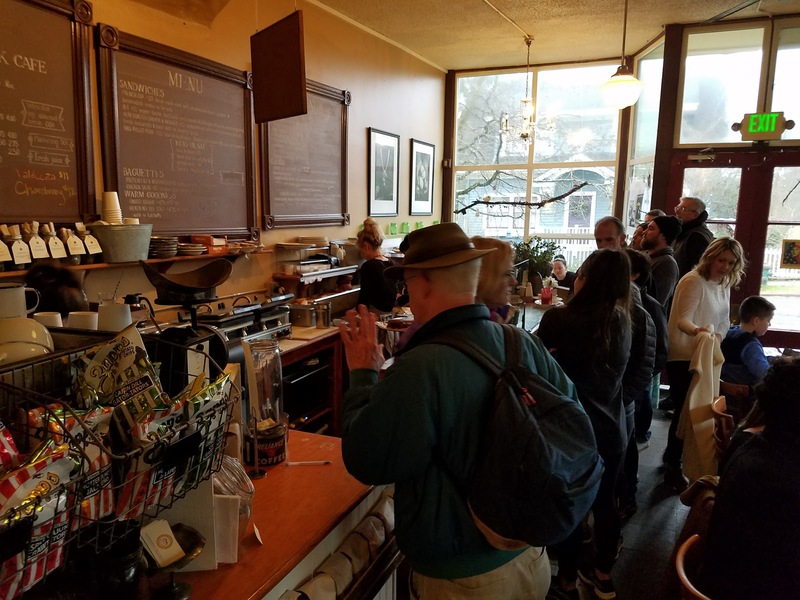 The place was really bustling and incredibly interesting. It had an old and comfortable feel to it. It was well worn but from loving patrons. The vibe was casual and vibrant and basically awesome. I was extremely impressed. There were little nooks and areas that felt so intimate and nice. They had what appeared to be homemade freezerves and just great things that I wanted to eat. Zoom in and you will see that the French Dip is their headliner sandwich. So I was hopeful. I felt like this place meant business. 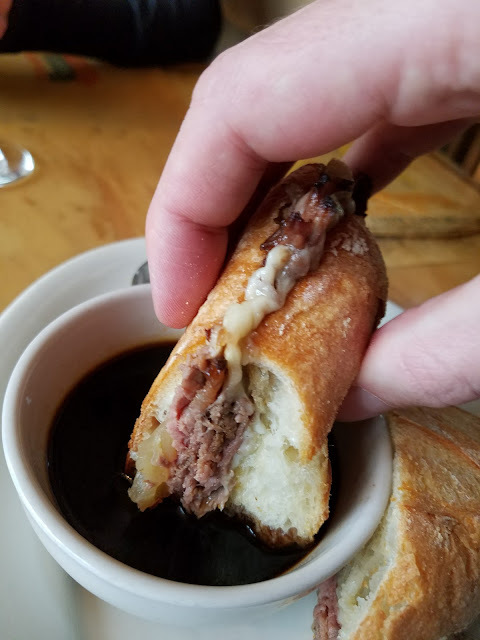 And given that someone had told me about this French dip I felt it must be special. But I am not someone who likes to get my hopes up very far so I was keeping my cool even though I did pee in my pants just a little, from the anticipation and pure glee! There she is. "French dip. $13. 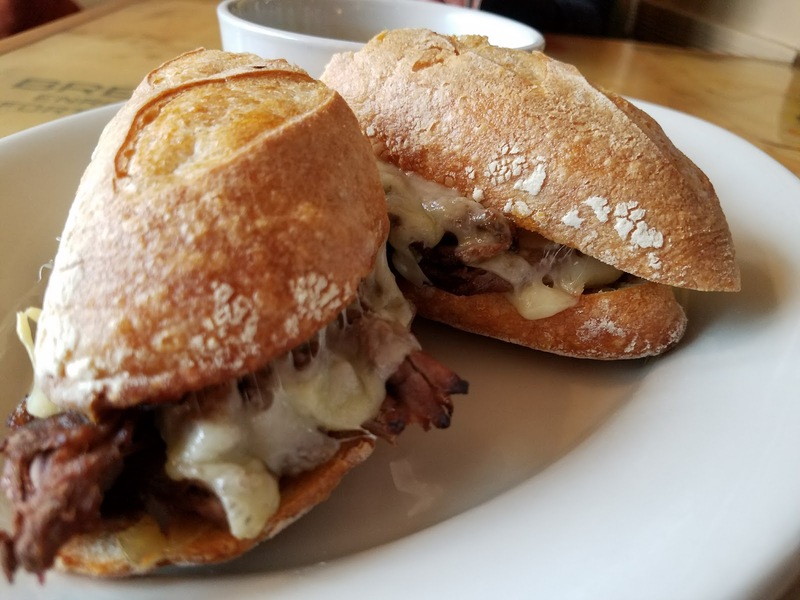 house made roast beef, caramelized onions, gruyere & horseradish cream on the side." I was happy about the caramelized onions and gruyere is not very common. And I was also pleased that they are clear that the horseradish cream is on the side which to me is far more appealing than slathered all over in such a way that it will absolutely ruin your enjoyment of this sandwich. And here they are peddling great looking cakes as we wait in line. 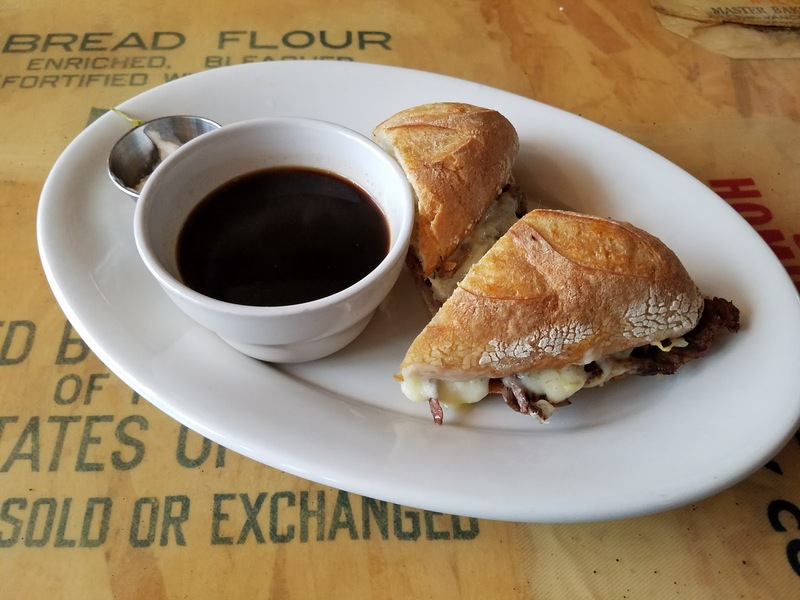 While waiting, I was asked by one of the ladies by the counter if she could start any food for me, so I ordered the French dip. 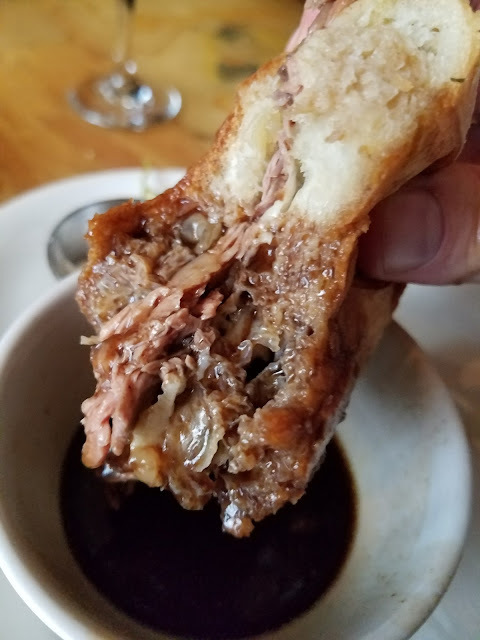 I don't have a sign on me that says I review French dips but I think people, by now, would just see it in my eyes and absolutely know that I was there to nosh on that product. 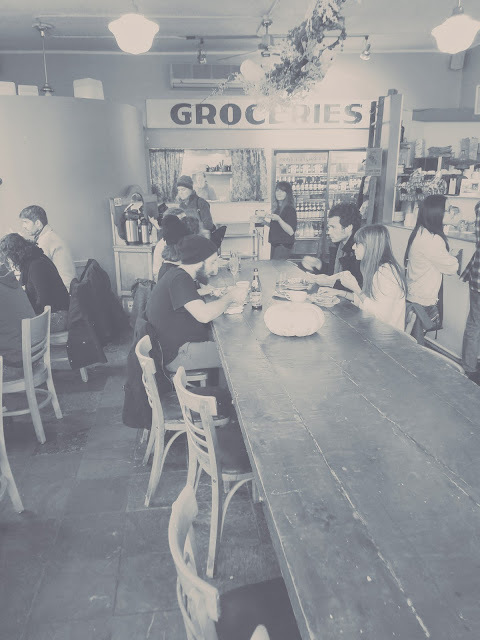 Here is a table of hipsters. The couple there each had their own black hats and I am nearly positive that their two friends also had identical black stocking caps. Clearly some kind of fad. Fighting the system together, I'm sure. Or were they pro-Trump!?!? Some fun ornamentation they had going on. I love owls. I talked to these people behind me in line at some point. They were fairly interesting. After I told them of my French dip hobby/habit/problem/addiction, the lady thought it was great and disclosed that she'd always wanted to travel the country "looking for Johnny Appleseed". I had no idea what that meant and said as much. She tried to explain but I was convinced she was a complete and udder lunatic. I just did a little bit of research on Mr. Appleseed and it turns out that the lady is perhaps not entirely insane. There are apparently many historical sites dedicated to that historical figure. Not sure what her blog would do to honor the feller. 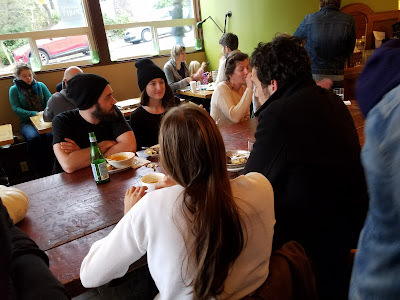 Another view of the long table and the hipsters. Jessica had gone and secured us a table while I had ordered. 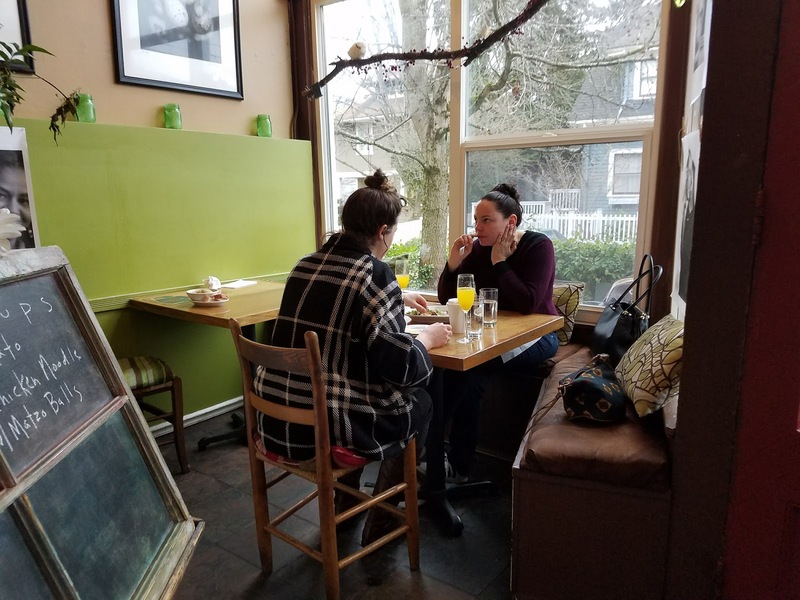 She had had a large breakfast with her friend Jessica B. so she wasn't hungry. But I did bring her a mimosa. 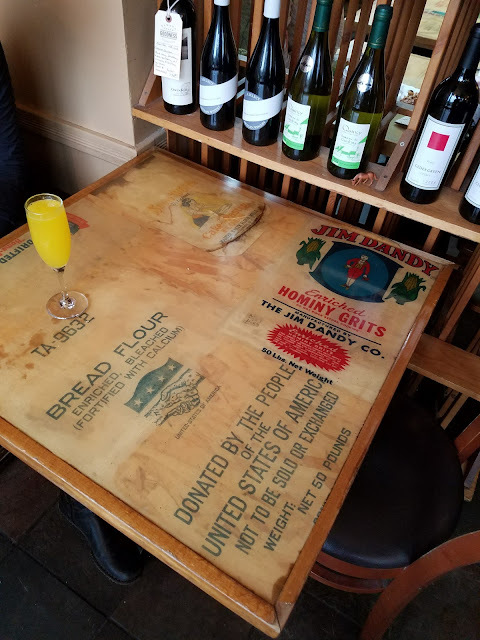 I continued to be impressed with all of the sights and scenes including our very unique table. My order was quickly called and I dashed to grab it. 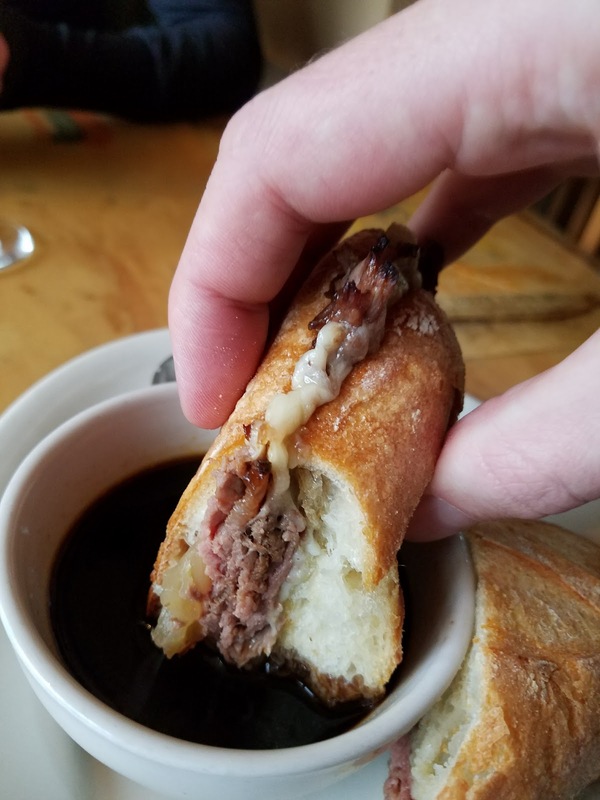 You'll note that the au jus cup is pretty well filled up but I needed to go back to ask the ladies to fill it up more. In the beginning they had been very skimpy (sad!) 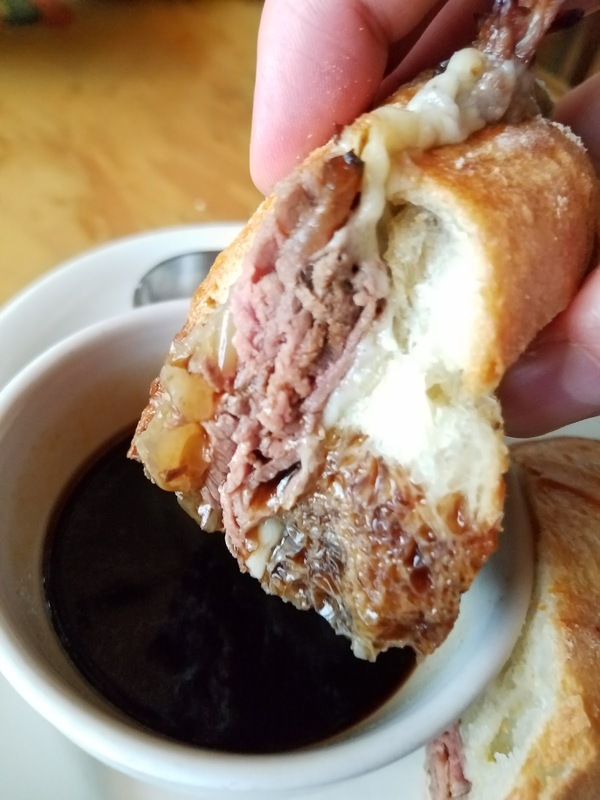 with their au jus contribution. 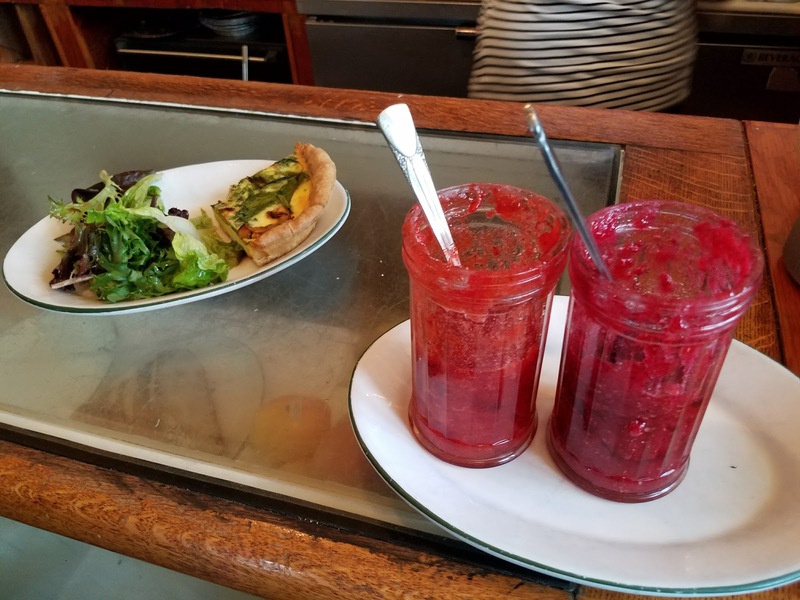 We see here that the jus is dark and rich, the plate is nice and white, the sandwich and bread look quite good, there is melted cheese and my horseradish cream is indeed on the side. Let's get up close and personal with this thing. We can tell that the gruyere is very nicely melted. We see the bread looking quite handsome with its little flour patches and whatnot. The beef looks good, too. 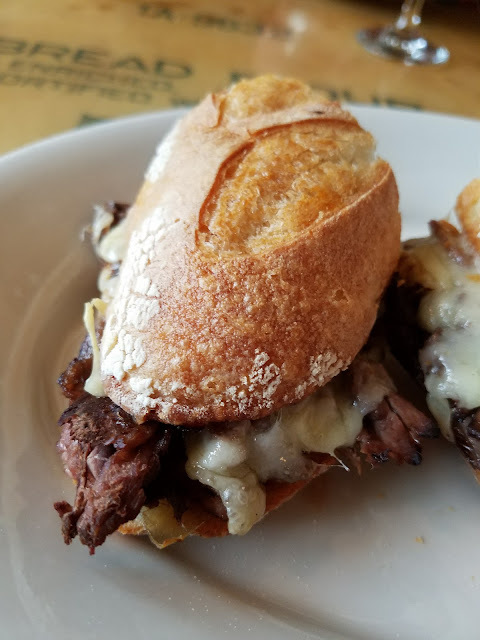 We're digging the look of the melted gruyere. 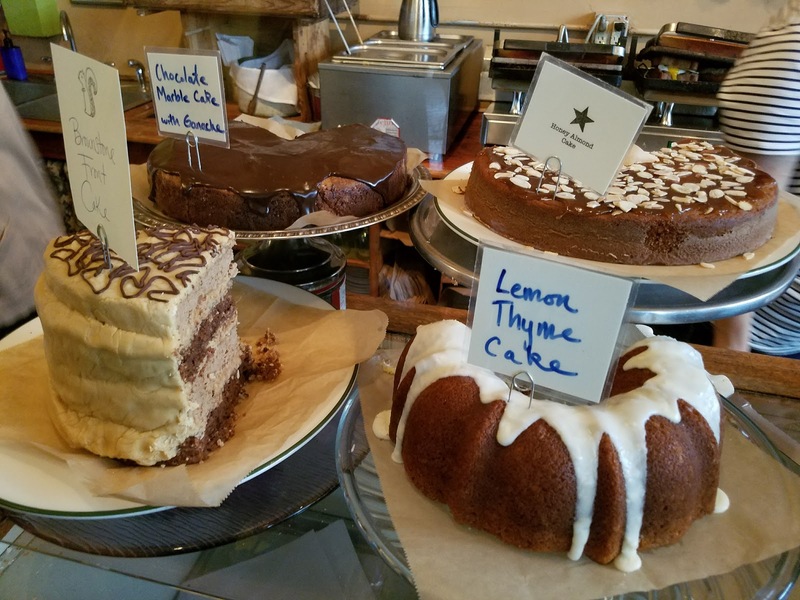 Our mouth is probably watering by this point if not definitely. We can look at the jus again. And a ha! We discover a very nice pickle spear that had not previously been disclosed or mentioned. A nice and fresh treat. 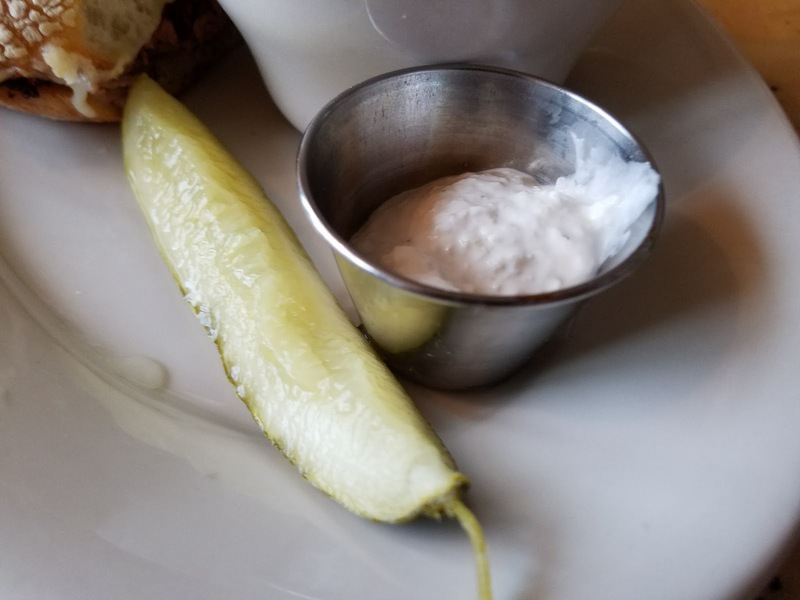 We can't really refer to the pickle spear as a "side dish" for any reason so we'll just think of it as something supplemental. We would later come to discover that--because the sandwich was not too large--that we would have wished that there was indeed a side to boot. Yes, they sold chips and whatnot but how was I do know that this meal of food they were to give me for $13 would not be enough. Yes, we are typically accustomed to getting fries or a side salad with our French dip so when that gift is not offered we get very sad. Sad! And we can take a look-see at the horseradish cream. It did wind up being pretty good although I did not use it strategically, rather, I tried it out on my very last bite to see what I had been missing. The only kind of horseradish that is really worth its weight in this context is not the creamy type but the real legit type that burns your nostrils. That's where it's at is in the nostril burning! My mom and I absolutely love prime rib with good horseradish. To me, it is very easy to appreciate the art and grandeur of this meal of food. It is very pretty and simple, yet we also predict it will be fine and delicious. Lots of words so far, right, for no tasting? Well, we're going to get to that. Right. About. Now! Wait, one more picture of the beef. Looks good and crispy. Bread still looking really good. And we can detect the caramelized onions if we stare really hard and cross our eyes. 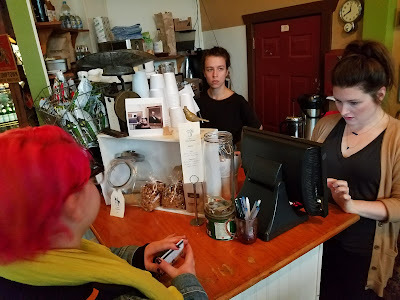 At this point I am going to disclose my "raw tasting notes" so you can get a sense of what all was to follow and what I was thinking and writing at the time. Really good bread. I must have liked it. Jus. 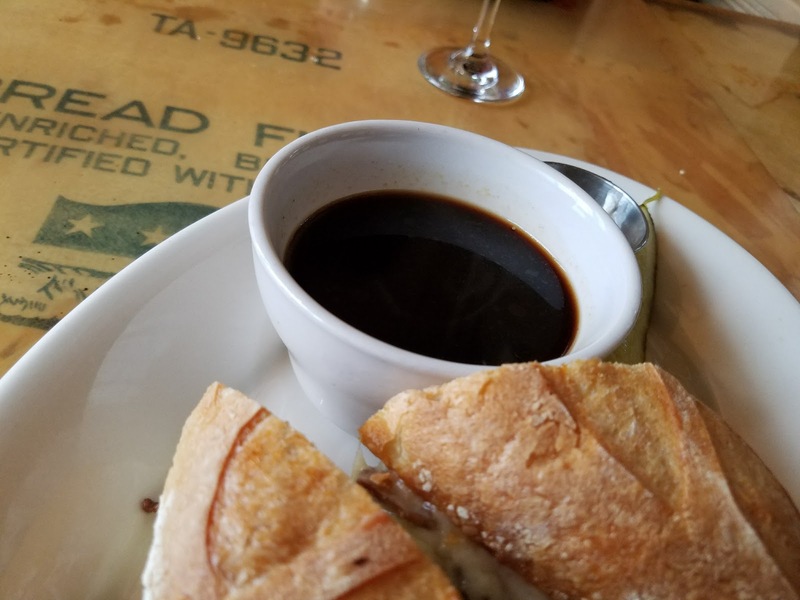 Au jus not hot, is dark, rich. So it was good overall but could have been hotter, could have been more initially. I know it didn't blow my mind but it was good. 4 of 5. The product overall is not especially salty, which is a good thing. You can go too far with that. 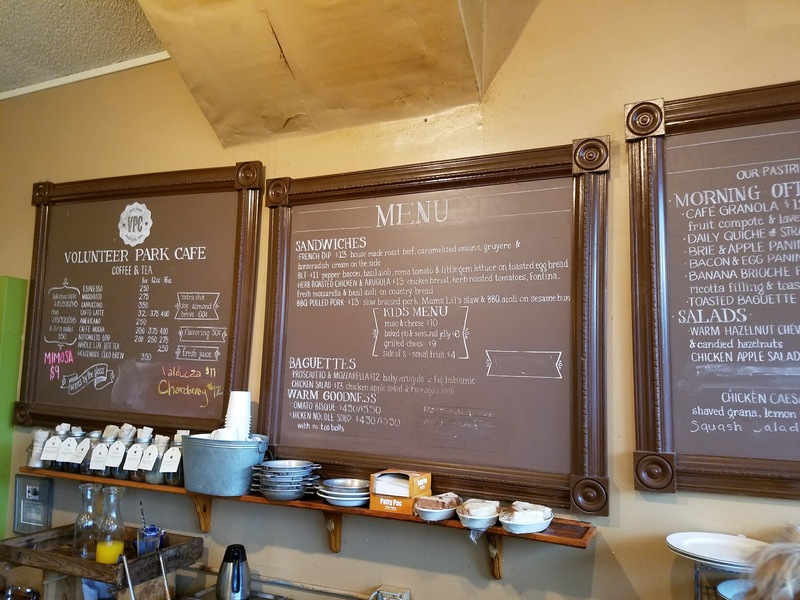 The sandwich is very good. It is balanced and complex. Bread. The bread is crunchy and chewy and gets a 5 of 5. Afterward, I realized it had cut my mouth. I don't think that scores negative points but it is a kind of difficult part of delicious bread. I suppose I need to work up my mouth calluses. There is some slight hint of pepper flavor in it, which is nice and enhances. The size is OK but nothing to write home about. Because there are no sides, it was not the world's most filling meal. The onions brought a slightly sweet taste, which was nice. Well-caramelized onions really are a treat on some dishes. They have an amazingly rich and delicious, smooth flavor. 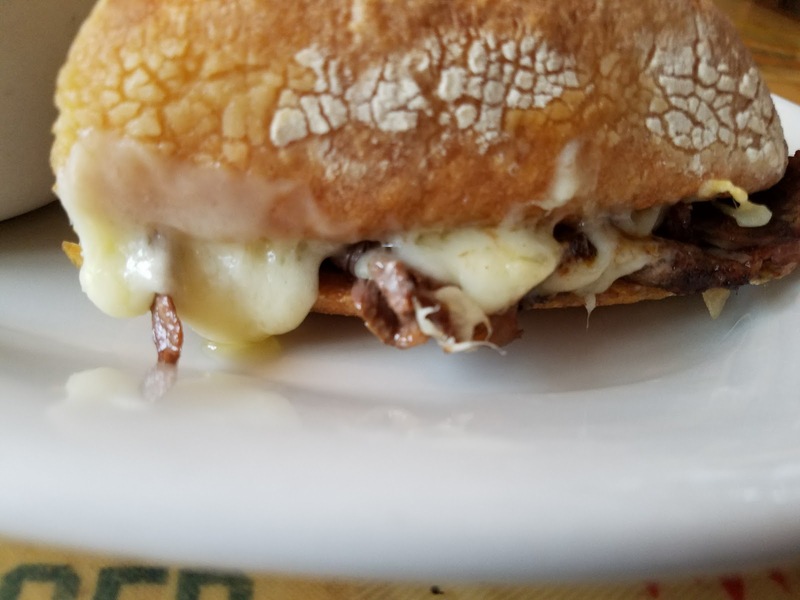 The gruyere cheese is very nicely melted and was complementary to the rest of the sandwich. I felt that the horseradish (on the side) was good and cool. It was herby, but when was I to use it? I find this to be a superfluous gimick that's really not necessary. 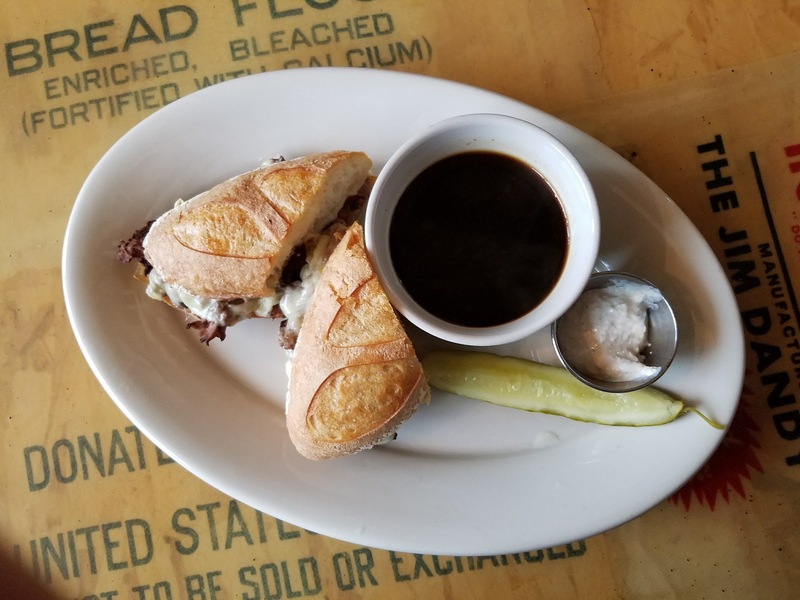 It is nice and gives the sense that people care about their meat and its partner, the horseradish, but I think it confuses the purpose of the French dip meal. Which one do I dip it in? How many dips do I need? An array of 50? Non-meat toppings. The cheese and onions overall were a 4 of 5. They were very good and additive. I think you have to do something really special in this category to get a 5. Overall 4 of 5. This wasn't a perfect sandwich but it was really good. 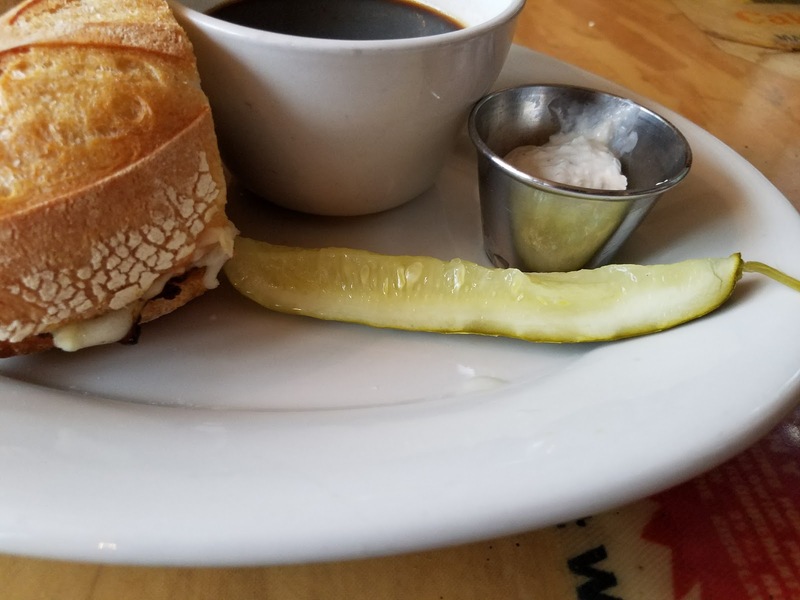 The ambiance of the place in the neighborhood and the attention they paid to this very fine French dip sandwich is commendable. Location 5 of 5. Such a cute little out-of-the-way place I would love to go back soon. Maybe next time with my own black hipster beanie and faux red hair! In general, the flavor of this sandwich was not to die for. Okay, so now I am holding this thing and real things are starting to happen. I took a bite and enjoyed the crunchy, chewy bread and the nice taste of the different and non-standard cheese and the onions. Here we can much more clearly make out the caramelized onions, which were indeed additive and delicious. 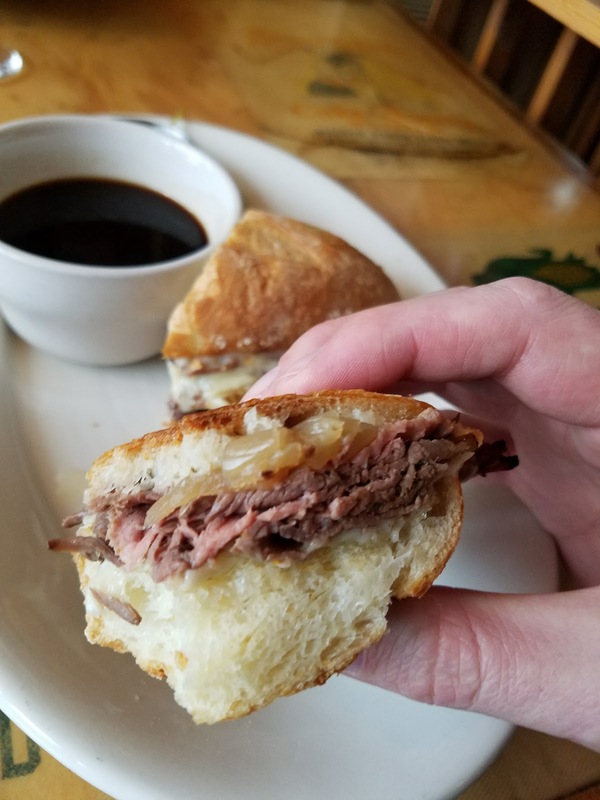 But we know with French dips that we do not eat them all without dipping them. So here I go with the immersion of the sandwich into its mate. Oh, God, there it is! There it really is, onions and cheese and rich jus and all! Nom nom nom. Yum yum yum. Fast forward fast forward. 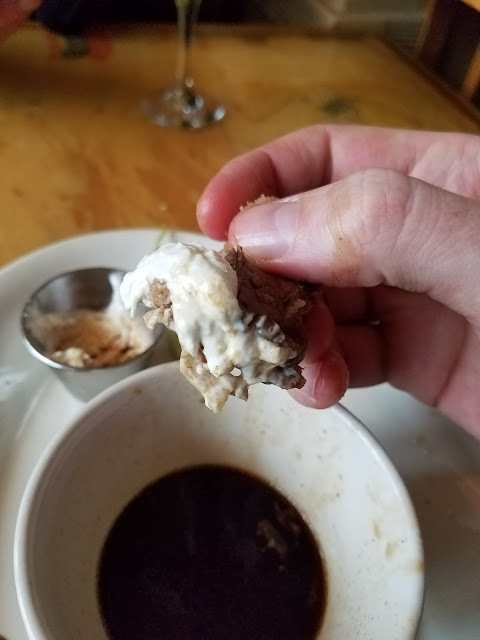 And I finally go for the last bite with the horseradish cream (plenty of it) to see what it is all about. It was pretty good. Not too heavy, was cold/cool and had a nice herb taste. It was also additive. 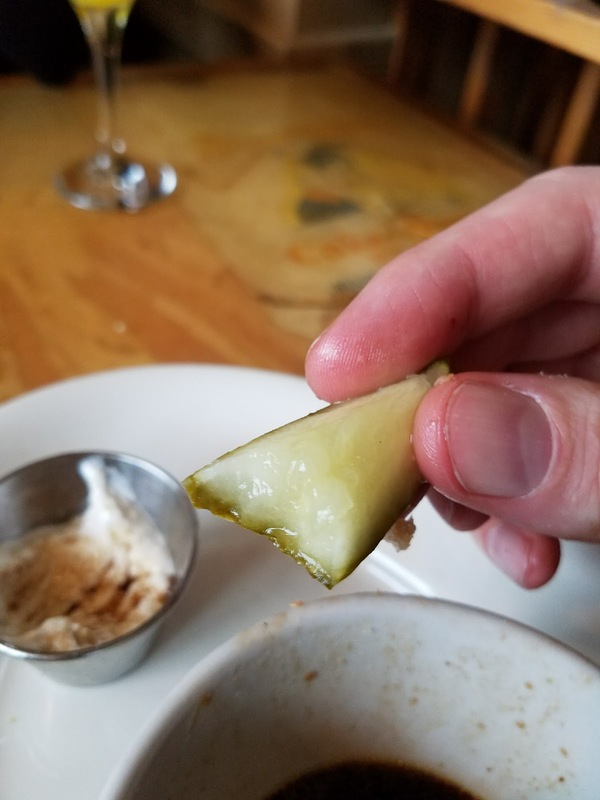 And a tasty, crisp pickle spear for dessert and as a pallet cleanser. 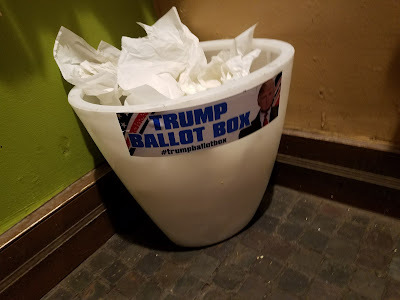 This was a fun little garbage basket they had in the restroom. And their sink was probably the tiniest I'd ever seen. 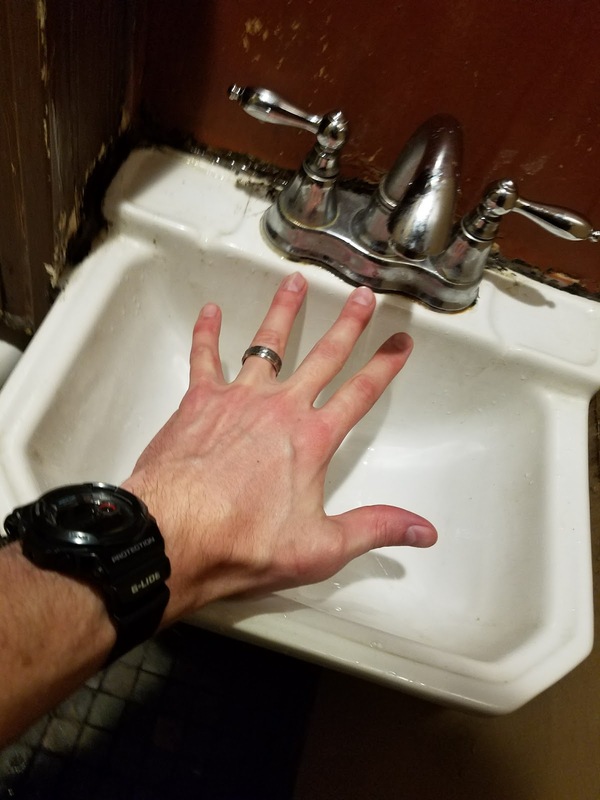 Like a sink for ants! I did some sweet stuff with Layouts and Instagram after I had this thing and put that out onto the internet which people seemed to appreciate. Making content for the internet (and people) is pretty fun. You should try it sometime!